Image Comics has announced the release of six new â“Image Firstsâ€ editions, printings of popular series’ first issues that only cost $1.00, to land in stores on May 1, just in time to coincide with Free Comic Book Day. 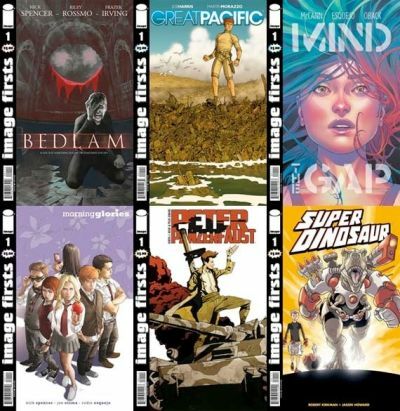 The six new titles are BEDLAM #1 by Nick Spencer and Riley Rossmo, GREAT PACIFIC by Joe Harris and MartÃ­n Morazzo, MIND THE GAP #1 by Jim McCann and Rodin Esquejo, MORNING GLORIES by Nick Spencer and Joe Eisma, PETER PANZERFAUST #1 by Kurtis J. Wiebe and Tyler Jenkins, and SUPER DINOSAUR #1 by Robert Kirkman and Jason Howard. The new Image Firsts issues will be in stores on May 1, joining thirty-one other Image Firsts editions, including some of Image’s most popular titles like THE WALKING DEAD, SAGA, FATALE, THE MANHATTAN PROJECTS, and INVINCIBLE. All are available for order now!